This represents '#pragma omp atomic' directive. In this example directive '#pragma omp atomic' has clause 'capture'. Definition at line 2177 of file StmtOpenMP.h. Definition at line 2298 of file StmtOpenMP.h. Creates directive with a list of Clauses and 'x', 'v' and 'expr' parts of the atomic construct (see Section 2.12.6, atomic Construct, for detailed description of 'x', 'v' and 'expr'). X 'x' part of the associated expression/statement. V 'v' part of the associated expression/statement. E 'expr' part of the associated expression/statement. UE Helper expression of the form 'OpaqueValueExpr(x) binop OpaqueValueExpr(expr)' or 'OpaqueValueExpr(expr) binop OpaqueValueExpr(x)'. IsXLHSInRHSPart true if UE has the first form and false if the second. IsPostfixUpdate true if original value of 'x' must be stored in 'v', not an updated one. Definition at line 661 of file StmtOpenMP.cpp. 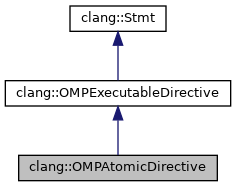 Definition at line 682 of file StmtOpenMP.cpp. Get 'expr' part of the associated expression/statement. Definition at line 2293 of file StmtOpenMP.h. Definition at line 2294 of file StmtOpenMP.h. Get helper expression of the form 'OpaqueValueExpr(x) binop OpaqueValueExpr(expr)' or 'OpaqueValueExpr(expr) binop OpaqueValueExpr(x)'. Definition at line 2274 of file StmtOpenMP.h. Definition at line 2277 of file StmtOpenMP.h. Get 'v' part of the associated expression/statement. Definition at line 2288 of file StmtOpenMP.h. Definition at line 2289 of file StmtOpenMP.h. Get 'x' part of the associated expression/statement. Definition at line 2267 of file StmtOpenMP.h. Definition at line 2268 of file StmtOpenMP.h. Return true if 'v' expression must be updated to original value of 'x', false if 'v' must be updated to the new value of 'x'. Definition at line 2286 of file StmtOpenMP.h. Return true if helper update expression has form 'OpaqueValueExpr(x) binop OpaqueValueExpr(expr)' and false if it has form 'OpaqueValueExpr(expr) binop OpaqueValueExpr(x)'. Definition at line 2283 of file StmtOpenMP.h. Definition at line 2178 of file StmtOpenMP.h.